Almost every cell in our body contains, at its centre, a small tangle of DNA. The genetic information this DNA holds is vital for every aspect of a cell’s life. As a result, it can have a direct impact on our own health. Developing an understanding of how this genetic information works is an important goal of medical science. One of the most significant breakthroughs in our understanding came around 10 years ago when scientists successfully sequenced the human genome. This research provided a massive leap in terms of our understanding of genetics. However, it also brought with it a number of unexpected surprises. The most baffling discovery from the human genome project was how few genes we humans actually have. A gene is a portion of DNA that contains usable information, in the form of a relatively short genetic code. This information tells your cells how to make important cellular components – proteins. We normally think of protein in terms of food but it turns out we literally are what we eat. The dry mass of our cells is made mostly from fat and protein, with a dash of carbohydrates. These proteins are hugely important to our cells. They act like tiny machines, rushing around the cell carrying out various intricate and essential jobs. Interestingly only a small amount (around 2%) of our total DNA actually codes for usable proteins. The rest of the DNA doesn’t contain any instructions on how to make protein and is therefore sometimes called ‘junk DNA’. It turns out human beings have only around 25,000 functioning genes. This may sound like a lot but when you consider that a round worm has 19,000 this number suddenly seems much less impressive. This was a big surprise since when the human genome project began it was assumed that, due to the complexity of human beings we would have a lot of genes, certainly many more than a lowly worm. No offence to round worms but we are way more complex. I mean they only have 970 cells, compared to our 60 trillion. It’s not a competition but if it were, we’d be winning. So how come we only have 30% more protein-coding genes than a simple roundworm and why is so much of our DNA junk? It turns out that we were a little too quick to judge these non-coding regions as ‘junk’. In fact we now recognise that this supposedly ‘junk’ DNA actually performs some very important jobs. Back in September the ENCODE project published 30 papers showing how ‘junk’ DNA can actually influence the way our genes are read. The non-coding or ‘junk’ regions can help switch genes on or off which, in turn, influences whether a cell makes a certain protein or not. Non-coding DNA can recruit machinery in the cell which can either promote or hinder the process of turning a gene into a protein. The non-coding DNA can also be actively modified by a process called methylation, which switches off genes. Methylation can occur at any point in your life and may represent a way by which our environment and lifestyle can actually change our DNA. This is one of many ways our underlying genetic code can be modulated and is called an ‘epigenetic’ alteration. Such epigenetic changes might go some way to explaining why genetically identical twins, who have lived quite separate lives, often become less alike as they age. Another way non-coding DNA switches genes on and off is by controlling how DNA is stored. If you were to unwind the DNA from all the cells in your body and stand it end to end it would reach to the sun and back….6 times. The reason the DNA can fit into our tiny cells is because it is wound up tightly on miniscule round structures called histones. It’s a bit like winding yarn round a spool – it takes up less space. 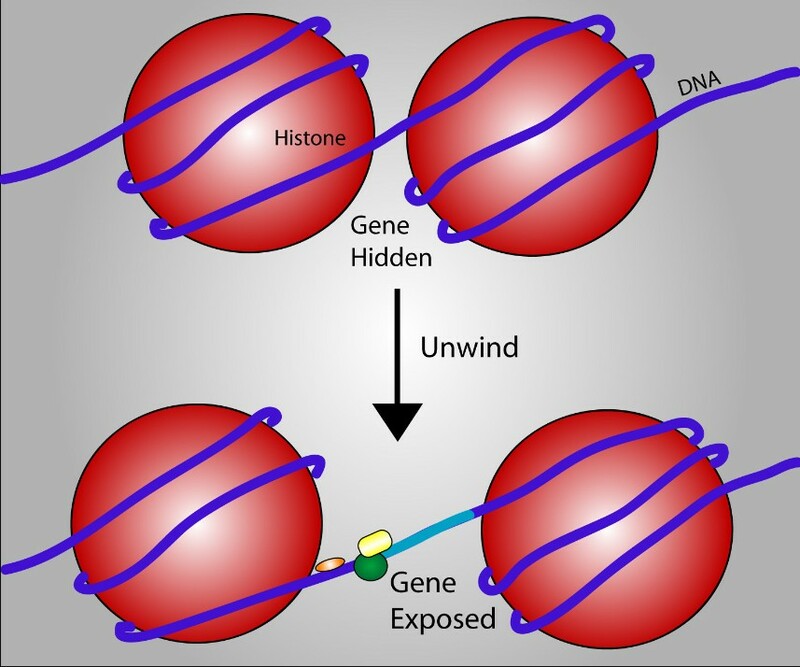 When DNA is tightly wound around histones the cell machinery that ‘reads’ the genetic message can’t access the genes. Non-coding DNA can recruit proteins which unwind the DNA, exposing certain genes and allowing the cell to make its corresponding protein. It’s essentially genetic peek-a-boo. Another layer of complexity is provided by the fact that once a gene is switched on, the instructions concerning how that gene is interpreted can be changed. This means that the same gene can make several slightly different proteins. The ability to control how, where and when to switch on a gene provides our cells with an amazing ability to adapt, specialise and respond to their environment. Although fundamentally important, knowing what genes are is only half the story in human genetics. Projects like ENCODE are helping shed light on the nuanced intricacies of how our genes are regulated and what makes human beings so complicated – or at least more complicated than round worms. Ultimately the understanding we’re beginning to develop will not only help tackle diseases, but will also help us understand what makes us who we are. Could Jennifer Aniston hold the key to memory formation? T Ryan Gregory, Larry Moran and a few others have been very critical of ENCODES public eulogy concerning the demise of the term Junk DNA, and yes, it is still a mystery as to why organisms such as the lowly protozoa can contain a genome size much larger than humans, and by orders of magnitude, but this is only a problem for the neo Darwinian paradigme/modern synthesis which in spite of its many defenders, seems to be crumbling at the seams in light of current twenty first century data. In my opinion Gregory and others can no longer make a sound correlation between C Value paradox (and yes I use the older term “paradox” rather than “enigma”) and so called junk DNA.